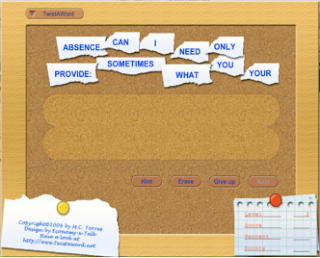 Recently-released TwistAWord is a new educational game made with Revolution and indicative of what a person can do with a little time one their hands (well, okay, maybe more than a little time). Four levels are supported as are phrases in eight languages (Catalonian, Danish, English, French, German, Latin, Portuguese or Spanish). The game is visually appealing and, had I not turned my sound down, no doubt my children would have excited by the game's sound effects. If you are wondering whether you as a normal human being (e.g., non-programmer) could make something similar, the creator of TwistAWord described its development as thus The scripting is laborious, tedious, but not very complicated, although I used a few tricks one might not immediately think of... The basics of the game are still relatively simple. TwistAWord is available for Windows or Mac OS X, and you can download a trial version which will quit after ten minutes of play. For a limited time, it is also available at a 33% discount for a total purchase price of slightly less than US$15.